They say beauty is only skin deep. But at the Genesis Health Institute, we know better. Beauty is more than just your outward appearance - it's a reflection of the confidence, charisma, and self-esteem that radiates from inside you, year after year. That's why Dr. Cabrera and his team of skilled skincare technicians are pleased to offer you the world's first hybrid laser skincare therapy: the highly innovative Halo Hybrid Fractional Laser. This non-invasive dual-power technology uses two powerful yet gentle wavelengths to maximize your treatment's effectiveness without the risks, costs, and long recovery times of cosmetic surgery or outdated skin treatments. Your wrinkles, acne scars, looseness, sun damage, spotting, and discoloration can be things of the past. Your journey toward rediscovering the naturally gorgeous and confident you starts here. Call our compassionate and skilled team today at (954) 561-3175, or contact us here. What Skin Conditions Does The Halo Hybrid Fractional Laser Correct? Our specialists at the Genesis Health Institute have been studying and successfully treating a huge variety of skin conditions for well over 10 years. Age, ethnic heritage, texture, skin type - we've seen them all, and we've earned our expertise from the challenges our patients have presented. Now we invite you to reap the rewards of our hard work, compassion, and dedication. We're pleased and honored to take this transformative journey with you - offering assistance, guidance, education, and encouragement every step of the way. Fast, gentle, and presenting few or no side effects, plus all the benefits of more complex and risky cosmetic procedures - that's what the Halo Laser offers you, and why we're so pleased to help you discover its amazing power. 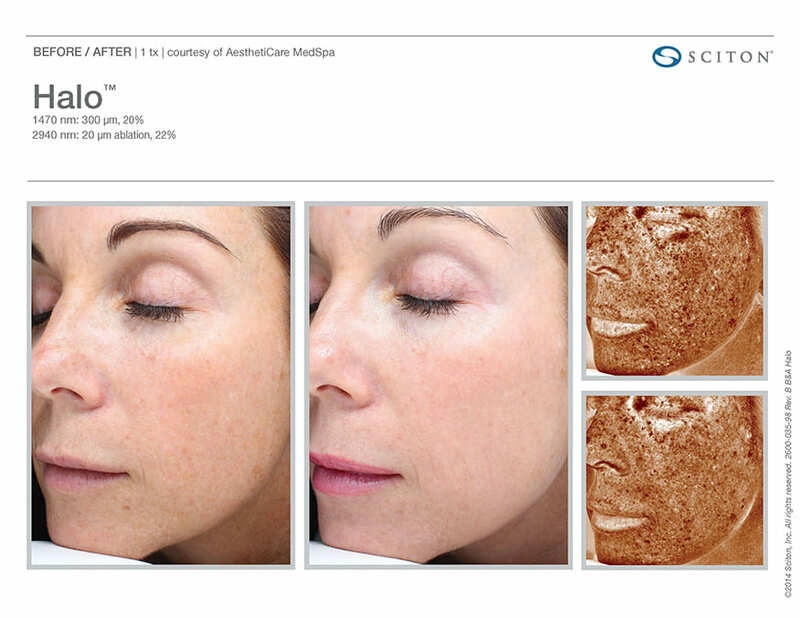 Our patients enjoy what we call the "Halo Glow" - that distinct brilliance your skin (and you!) radiate after experiencing this innovative treatment. How Does The Halo Hybrid Laser Work? The Halo Hybrid Fractional Laser by Sciton is one of the world's most advanced skincare technologies available. Packed with the power and precision to change your life in one or several brief treatments, this exciting medical advancement blends effectiveness with efficiency. In other words: all the benefits of progressive aesthetic procedures plus the reduced recovery time so vital for your busy schedule. 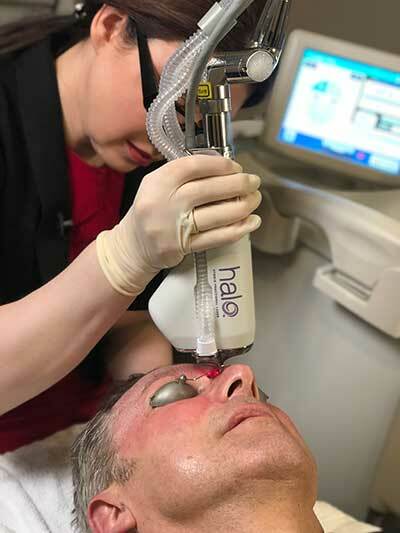 The Halo Laser is unique in its use of both ablative and non-ablative technology. First, the ablative laser targets microscopic pathways in your skin while leaving the areas around those pathways untouched. Then, the non-ablative laser creates tiny thermal openings in your skin, triggering the production of collagen and elastin - the building blocks of healthy new skin - tightening wrinkles, shrinking pores, and stimulating the growth of fresh, radiant skin over sun-damaged, acne-scarred, or prematurely aged cells. The result? Fresh, smooth, naturally gorgeous skin that glows with a healthy, rejuvenated aura. That's the Halo Glow. 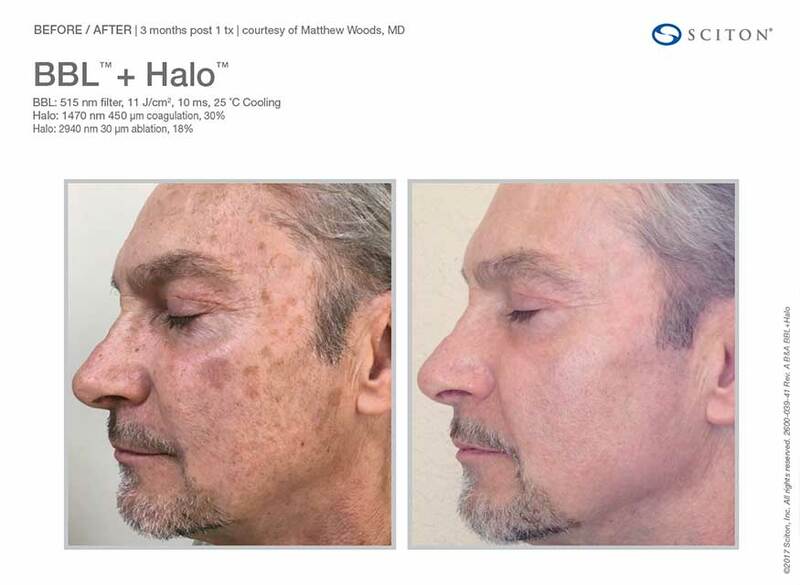 Who's A Good Candidate For Halo Hybrid Fractional Laser? During your consultation, be sure to discuss any medical conditions or medications you are taking that might sensitize you to light, affect wound healing, or interrupt blood clotting. Be sure to tell Dr. Cabrera if you've taken Accutane during the past year, as this can affect your Halo Hybrid candidacy. First, you'll meet with Dr. Cabrera to discuss your skin type, your current skin condition and other medical conditions, any medications you're taking, your expectations, and any concerns you may have. Please feel free to speak openly and honestly - we're here for you, so take as much time as you need to feel comfortable and confident about your treatment options. Then you and Dr. Cabrera will create a customized treatment plan based on your needs and expectations. This consultation step is crucial for getting the results you desire and minimizing the chances of any negative side effects. On the day of your treatment, you'll lie down or sit in a comfortable position. While most patients handle their treatments with little or no pain, you can request a topical anesthetic to numb your treatment area. If you're feeling nervous, you can ask for a mild sedative. Your eyes will be protected with safety shields or glasses. Dr. Cabrera will then pass the handpiece over your skin a number of times, assisted by computer software that ensures the light energy is directed evenly throughout your treatment area for consistency. This software (known as Visia 3D Skin Analysis) highlights problem areas like dark spots, UV damage, tiny wrinkles, and blood vessels not easily seen by the naked eye. Unlike chemical peels, Halo Hybrid is supported by digital technology for uniformity and consistency. You may briefly feel a warming sensation or a slight snap (like a small rubber band) on your skin as the light passes over it. This experience is typically very mild and most patients tolerate it easily. Your treatment time varies depending on the area being treated and the severity of your skin condition. It may take as little as 30 minutes or up to an hour and a half. There is virtually no downtime after this non-invasive and gentle procedure. In most cases, you are able to apply cosmetics, return to work, and resume most of your activities immediately, though it's best to rest and avoid strenuous activities for the rest of the day. Dr. Cabrera will be happy to discuss these details with you before you receive treatment. After your treatment, your skin will begin peeling. This is normal and is part of the skin regeneration process. You will see improvements in your skin tone and texture after your skin is done peeling, which typically takes about one week. You will see initial results between 2-5 days after your treatment, which will then continue improving. Over the next 2-3 months, you'll enjoy noticeably reduced discoloration, smoothing of fine lines and wrinkles, reduced pore size, skin reflectivity, and a healthy, radiant glow. Most patients need only one treatment. However, depending on how loose your skin is and how your body responds, you may need several sessions. Future touch-up treatments can help keep your skin looking soft, silky, and beautifully contoured. Many patients report their treatments giving them long-lasting results - even for years. Taking good care of your skin, especially using sunscreen, will help it retain its tightness and youthful appearance. Immediately after your treatment, it's best to avoid sun exposure unless it's absolutely necessary - especially for the first 24 hours. Long periods of sun exposure should be avoided. For best results, following Dr. Cabrera's aftercare instructions is absolutely crucial. After 24 hours, your skin will start peeling and you can resume your normal activities, but it's very important to protect your skin with sunscreen. Are There Any Side Effects to the Halo Hybrid Fractional Laser Treatment? Follow Dr. Cabrera's instructions exactly until your skin is completely healed - typically one week after the treatment. Your facial skin may need more time to heal than other treatment areas. How Much Does Halo Hybrid Fractional Laser Cost? Your treatment cost will vary depending on your desired treatment area, your current medical situation, the number of sessions and intensity required. Speak with our team of professional specialists to discuss your cost and payment options in greater detail. Currently, Halo Hybrid is not covered by medical insurance. Your skin is your best friend. It's your body's most important organ and a reflection of your inner beauty. It deserves the best care available. Halo Hybrid Laser is the world's first and only dual-action light therapy that empowers your self-esteem and quality of life. Dr. Cabrera is glad to help you recapture the naturally gorgeous glow and attractive self-confidence you desire and deserve. Take the first step toward awakening a brand-new you today by calling our team of elite professionals in Wilton Manors at (954) 561-3175 or contacting us here.